Internationally bestselling author Anthony Horowitz's nail-biting new novel plunges us back into the dark and complex world of Detective Sherlock Holmes and Professor James Moriarty in the aftermath of their fateful struggle at the Reichenbach Falls. Days after Holmes and Moriarty disappear into the waterfall's churning depths, Frederick Chase, a senior investigator at New York's infamous Pinkerton Detective Agency, arrives in Switzerland. Chase brings with him a dire warning: Moriarty's death has left a convenient vacancy in London's criminal underworld. There is no shortage of candidates to take his place including one particularly fiendish criminal mastermind. Chase is assisted by Inspector Athelney Jones, a Scotland Yard detective and devoted student of Holmes's methods of deduction, whom Conan Doyle introduced in The Sign of Four. The two men join forces and fight their way through the sinuous streets of Victorian London in pursuit of this sinister figure, a man much feared but seldom seen, who is determined to stake his claim as Moriarty's successor. 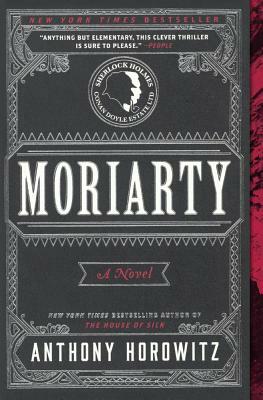 Riveting and deeply atmospheric, Moriarty is the first Sherlock Holmes novel sanctioned by the author's estate since Horowitz's House of Silk.